Combining the friendly nature of the Cavalier King Charles Spaniel with the intelligence and low-shedding coat of the Poodle, the Cavapoo is an increasingly popular crossbreed. You shouldn’t get one if you’re not happy to be stopped in the street so that people can say hello to your cute little “teddy bear”, because without doubt this will happen on a regular basis. But in spite of their very many attractive characteristics, this isn’t the perfect dog for everyone. This guide will give you all the information you need to decide if a Cavapoo would be the right dog for you. The sweet tempered Cavapoo makes a great family pet – but a poor guard dog. It could be a good choice of companion for humans with allergies. They need regular grooming to avoid matted coats. The color of your Cavapoo will probably affect its price but be warned – color is likely to change as your puppy grows up. It is quite easy to teach Cavapoos new tricks and commands. Despite their small size, they are very energetic dogs. Cavapoos get very attached to their owners and are prone to suffer from separation anxiety. They are sensitive dogs who will react to their owner’s mood. They can be fussy eaters with sensitive tummies. The health of your dog will largely depend on the health of its parents. You may not be able to bring home a Cavapoo as soon as you would like. The Cavapoo, or Cavoodle as it known in some countries including Australia, is a cross between the Cavalier King Charles Spaniel and the Toy or Miniature Poodle, and has characteristics of both (it is more common for the Poodle to be the father). Cavalier King Charles Spaniels are friendly dogs that love the company of humans. Poodles are regarded as one of the smartest dog breeds, and shed a minimal amount of hair. Cavapoos attract a lot of attention from strangers for their adorable, teddy bear-like appearance and friendly nature. The hybrid has an affectionate and gentle temperament and is relatively small, making it a suitable companion for families with small children, the elderly and other pets including cats. They have plenty of energy to keep up with active children and are playful, fun dogs to have around. They are patient, easy going, loving, sociable lap dogs that thrive on receiving attention from family members and meeting new people and pets. However, as with all dog breeds, young children and small animals should be supervised when in the company of a Cavapoo in order to prevent accidental injuries. They love to chase anything that moves (Spaniels were originally used to hunt rabbits) and are likely to chase squirrels, birds and other small creatures. As with all mixed breeds, Cavapoos can vary in appearance and nature, depending on whether they take more after their mother or father. While some may bark to warn their family about the presence of a stranger or intruder, others may not, meaning they do not make reliable watchdogs. They are usually friendly toward strangers and it is very rare for them to show any aggression – as long as they have been socialized properly. Their puppy-like faces will not intimidate anyone. For these reasons, a Cavapoo is not a good choice for you if you are looking for a dog to help guard your premises. With crossbreeds, you can never be sure which characteristics are passed down from parents to offspring. The Cavapoo may have a long, straight coat like the Cavalier King Charles Spaniel, a curly coat like the Poodle, or a coat that is wavy or slightly curly. Coats can be straight like a Cavalier King Charles Spaniel, curly like a Poodle, or something in between. Some Cavapoos inherit the non-shedding gene of the Poodle but this can never be guaranteed. Their coat will generally be very low to non-shedding, which is why they are sometimes described as hypoallergenic. Many humans with dog allergies find that they are able to tolerate the coat of a Cavapoo or other Poodle crossbreed much more easily than that of other breeds. It should be noted that the curl gene and non-shed gene are totally separate, so it is not necessarily the case that a Cavapoo with a curly coat will not moult. Their coats tend to tangle easily, no matter whether they are straight, wavy or curly. They need to be brushed or combed regularly – ideally every couple of days – in order to avoid knotting and matting, especially if the coat is long. Most Cavapoo owners take their pets to a groomer and get their coats clipped which is a cost to bear in mind. I take mine to the groomer every eight weeks; much longer and the hair around her eyes would affect her vision. You could keep costs down by investing in clippers and learning how to do it yourself. Cavapoos need to be brushed or combed several times a week as their hair tangles easily and can get matted. Most Cavapoos get their hair clipped every 6 to 10 weeks at a grooming salon or at home. They should not be bathed more often than around once a month as frequent washing will remove the coat’s natural oils. Washing them too often on a regular basis will result in dry skin and a dry, flat coat. These “designer dogs” are relatively expensive and can cost more than many purebreds. The price depends on a number of factors such as the breeder, health of the parents, gender (girls are usually more expensive), and color. Their coats can be a variety of colors including black, white, red, apricot, gold, tri-colored (black, white and tan) or Blenheim (red and white). The coat can be one solid color or made up of various complex markings. Black ones are usually the least expensive, red ones the most expensive (especially if they have flashes of white on their head, chest, feet or tail), and golden ones are in the middle. Cavapoo coats tend to get lighter as they mature. Ruby, shown above, started off as a “red” puppy but this color faded except from her face and ears within a couple of years. Before setting your heart on a particular color, or paying a premium for one, you should be aware that most owners experience a significant change in color in their dog’s coats as they mature, with most getting much lighter. This is the result of the “fading gene” inherited from the Poodle line. A Cavapoo’s coat is less likely to lighten if the Poodle parent was red than if it was white. Cavalier King Charles Spaniels are intelligent dogs that are willing to learn and eager to please their owner but they often have a stubborn streak and need to be properly trained to make sure they don’t develop a bad habit of ignoring commands. Poodles are highly intelligent and need regular mental stimulation in order to avoid becoming bored. These are the reasons that Cavapoos pick up new tricks and commands quickly and are fun to train. Even youngsters can master “sit”, “down”, “come”, “wait”, “shake”, “roll over” and similar commands. Cavapoos are surprisingly fast for their small size and like other Poodle crossbreeds, they sometimes run around like crazy in what is known as a “Doodle Dash” or “Zoomies”. They are also very athletic and they will do well in any sort of advanced training or obedience competition such as agility or Flyball. Cavapoos are relatively small with a relatively light build, which means they are suited to a wide range of owners and homes including apartments. Regarded as a larger member of the Toy Group, their size partly depends on whether they were bred using a Toy or Miniature Poodle. When measured at the shoulder they may stand between 9 and 17 inches (22 and 45cm) and they may weigh between 13 and 33 pounds (6 and 15kg). Cavapoos vary quite a lot in size, depending on whether they were crossed with a Toy or Miniature Poodle. They usually stand between 9 and 17 inches at the shoulder. However, they require a moderate amount of exercise – one long or two short walks – every day to keep them healthy, so if you don’t have a yard make sure there is space nearby where your pet can run around safely. Some exercise can take place indoors. A game of tug of war or fetch can provide mental as well as physical exercise. Cavapoos can be excitable dogs and like other Poodle crossbreeds they sometimes do a “Doodle Dash” or “the Zoomies” which is very entertaining to watch. This is when they run around like crazy and release pent-up energy; it is not harmful and tends to be more common in puppies. Cavalier King Charles Spaniels and Poodles are both companion breeds so it is not surprising that Cavapoos love spending time with people and other dogs, whether they are going for a run or snuggling up on the couch. Cavapoos enjoy exercising but also love to cuddle up in front of the TV with their human companions. They are happiest when they are with their owners, to whom they become strongly attached. They want constant company and will get upset if their owner has to go away for a while. I can’t even go to the bathroom without my dog acting like my shadow. They are adaptable dogs and love joining the family in activities and on outings. They do not get stressed about being away from their normal surroundings, for example while on holiday, as long as they are with their family members. They can suffer from separation anxiety when left alone for long periods. It is generally advised that they are not left alone for longer than about four hours. If you have to be out at work all day, you could consider hiring a dog walker to break up their day or taking them to doggy daycare. These sociable dogs do not cope well in kennels and need lots of attention. A dog with separation anxiety will often bark, become destructive, go to the toilet indoors and drool excessively. The Poodle temperament is usually soft and sensitive, and Cavalier King Charles Spaniels are rated among the breeds most receptive to human emotion, so it follows that Cavapoos are also quite sensitive and may not do well in a home where there is a lot of conflict or noisy activity. Cavapoos are quite a sensitive breed, like both of their purebred parents, the Cavalier King Charles Spaniel and the Poodle. They will try to cheer you up if you are unwell or unhappy. If a Cavapoo senses that you are unwell or unhappy, it will react by staying close by your side and even licking your tears away. Even a cough or sneeze is enough to bring my dog running to check that I am okay. Have you ever seen that viral video by the man who pretended to collapse to see how his pet Dachshund would react, only to find that his pet didn’t even notice and walked off? That would never happen with a Cavapoo. Like many others, my own dog has been fussy about the type of bowl she eats from as well as the food itself. Some dogs are even fussy about the time they eat, perhaps not getting an appetite until later in the day. We’re currently on our 5th brand of food in 3 years, simply because she has got bored of the food that was offered to her. I know she would eat whatever she was offered if the alternative was going hungry, but I want her to enjoy her mealtimes and, of course, be healthy. She eats a good quality (high meat content and low filler content) kibble with a wet food “topper”. Dry kibble is good for dogs’ teeth and convenient for owners to store and serve, but some dogs don’t like it. If your dog doesn’t want to eat it, you could try to make it more appealing by pouring some hot water over it to make a gravy. Wet food usually has more taste and could be a better option for picky eaters; the downside is that because it often contains fresher ingredients it is a bit more expensive. Many Cavapoos are fussy eaters, sometimes turning up their nose at foods they previously ate without any problem. There are plenty of different types of food that owners can try feeding their pet, but a visit to a vet could help rule out an underlying health condition. Other owners swear by giving their pet a raw diet. All dogs are different and fortunately there are lots of different options for owners. It is not recommended to switch types or brands of food suddenly; it should be a gradual process over a couple of weeks. A poor appetite or sensitive stomach could indicate an underlying medical condition so if you have concerns you should speak to your vet. The question of when Cavalier King Charles Spaniels were first mated with Poodles is a matter for debate, but it is believed that the goal was to create a friendly, non-shedding dog that did not suffer from the genetic conditions associated with Cavaliers. These include Mitral Valve Disease, a serious condition that can cause epilepsy or death, and Syringomyelia, a condition affecting the spine. A Cavapoo puppy will usually be genetically healthier than either of its purebred parents, but it could develop conditions associated with either the Cavalier King Charles Spaniel or Poodle. Cavapoos were bred with the intention of creating a friendly, non-shedding dog that did not suffer from as many serious health conditions as Cavalier King Charles Spaniels. Conditions commonly affecting Poodles include Progressive Retinal Atrophy, a degeneration of the retina leading to blindness, and patellar luxation or slipping kneecaps. 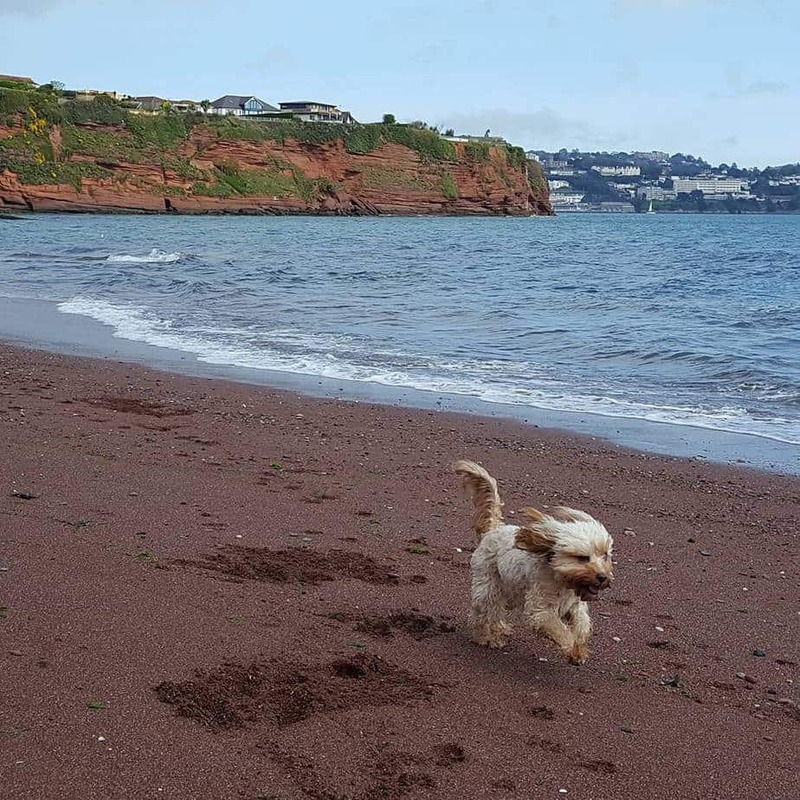 Cavapoo owners who have got their pet from a responsible breeder, who can prove that the parents have been checked for the most common conditions, can hope that their pet will have a life span of 13 to 15 years. The breed is not recognized by the American Kennel Club or similar organizations in other countries including the UK, but it will undoubtedly gain recognition by the various canine governing bodies in the future. You may find yourself on a waiting list for a Cavapoo puppy – but it will be worth the wait. The image above shows Ruby on the day she joined her new family aged nearly 9 weeks. It is a versatile dog that is a good choice of pet for people of all ages, and a good choice for first time dog owners. While they are becoming more common, it may be hard to find a breeder near you so you must be prepared to travel for the new addition to your family. And you must be prepared to wait as breeders often have long waiting lists. They are rarely found in rehoming centres which is an indication that people who welcome a Cavapoo into their lives don’t regret it.